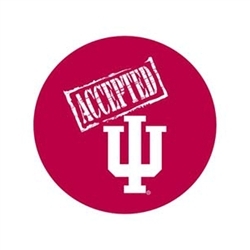 "Accepted IU" design is a great way to show your excitement of getting that long awaited acceptance letter from Indiana University. This fabric button which measures 2 1/4" in diameter. Crimson background with white design. Makes a wonderful gift to show how proud you are!